Homestyle corn tortillas filled with melted cheese and the fillings of your choice. 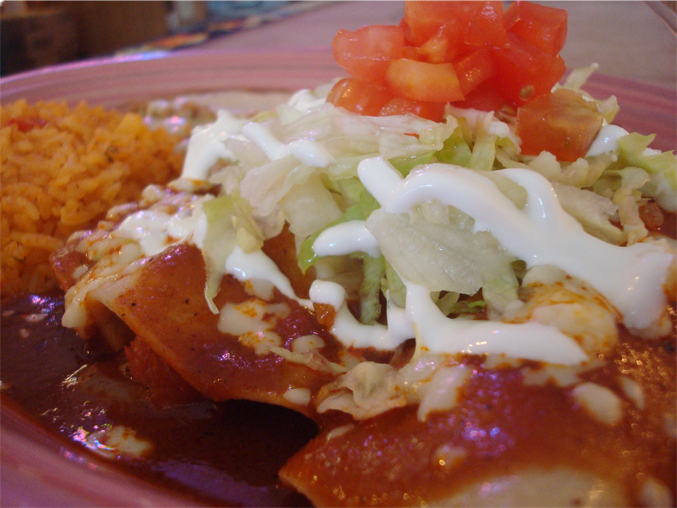 Two shrimp, onion, and tomato enchiladas covered in our cheese sauce with rice and beans on the side. Three shredded pork enchiladas covered in our green salsa and cheese topped with chorizo and served with rice and beans. Four enchiladas with one bean, one cheese, one chicken, and one beef covered with enchilada sauce, cheese, lettuce, tomato and sour cream. Three chicken enchiladas topped with our delicious cheese sauce, served with a side of rice. Three chicken enchiladas covered in our green salsa and cheese with rice and beans on the side. Three cheese enchiladas topped with shredded beef, enchilada sauce and shredded cheese, comes with a side of lettuce and tomato. Three beef enchiladas topped with enchilada sauce, cheddar cheese and a side of rice and beans. Three chicken enchiladas topped with enchilada sauce, lettuce, tomato, cheese and sour cream with a side of rice and beans.